It can be all too tempting to hide away and hibernate during the long winter months, but getting out into the countryside and going for a bracing walk can really help to lift your spirits. “Going out for a winter walk will not only help your physical health but the fresh air, exercise and scenery can really boost your mood,” says Simon Barnett, director of walking development at the Ramblers (www.ramblers.org.uk). However, it’s important to plan ahead when you are going walking in the winter as the short daylight hours and the possibility of snow and ice can lead to problems. “Stay safe, know your limits, and be prepared, but make sure you have fun,” says Carey Davies, hill walking development officer with the British Mountaineering Council (www.thebmc.co.uk). “We always advise people to take care when walking in mountainous regions during the winter,” says Simon. “Check the weather before you set off, plan walks carefully to take account of the early sunset and make sure you have the right equipment with you, including warm clothes.” A head torch is an invaluable piece of equipment and it’s a good idea to take a back-up torch as well. “The short hours of daylight can often catch people out which is why it’s a good idea to make an early start during winter,” says Carey. You will be expending a lot of energy if it is particularly cold and you are planning a long walk so it’s essential to take some snacks to keep your energy levels up. Pack a flask containing some warming herbal tea or vegetable soup and make sure you have plenty of water on you to keep yourself hydrated. Low sugar flapjacks and granola bars made from nuts and seeds will help to sustain you on your walk. 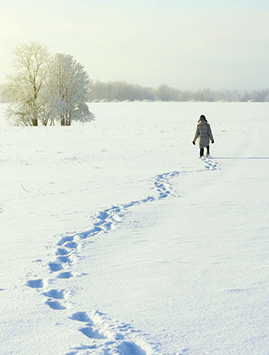 A first aid kit is an essential item to bring on your winter walks. Good things to include in it are assorted plasters, bandages, zinc oxide tape, sterile wound dressings, sterile cleansing wipes, tweezers and scissors. Also bring a whistle with you to attract attention and a head torch that has an emergency flash setting. You might even want to pack a foil survival blanket in case of emergency. Make sure you bring a fully-charged mobile phone with you and make sure someone knows where you’ve gone and when you expect to be back. Remember to be prepared, keep safe and enjoy yourself!